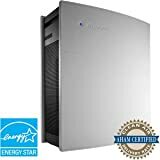 Blueair HEPASilent 455EB Air Purifier with Bonus Filter , selling for $659.99 brand new. Manufactured by Blueair. There are 10 units left brand new. Smokestop units ship with one set of filters, the smokestop filters. The smokestop filters include both the particular filtration and the activated carbon for gas and odor removal. The BlueAir 450E series air purifier effectively removes indoor air pollutants in rooms up to 365 sq ft. Thanks to patented HEPASilent technology, the unit captures 99.97% of 0.1 micron particles including allergy-provoking pollen grains, dust mites, mold spores and pet dander. The 450E gives you the power to manage your indoor air quality with a handy remote control and digital display from a distance of up to 20 feet. Set your 450E on auto mode and let it regulate the speed according to the actual amount of particles and gaseous contaminants present in the air. The BlueAir E series is an excellent choice for people with allergy, asthma or other respiratory conditions or for health-conscious individuals who simply want to breathe cleaner air and have convenient control of indoor air quality.